"As politicians, our actions must match our rhetoric. No buying off domestic opinion with subsidies and barriers. At a time of global and economic uncertainty and of financial instability we must not pander to people's fears by peddling false hopes of protectionism. In years to come, the world will look back at this period, and there will be heroes and there will be villains. The heroes will be those who held their nerve and stood up for free trade. The villains will be those who tried to push us over this tipping point and down the dangerous path of protectionism." He singled out Republican candidate John McCain for praise in this respect, for arguing that protectionism would not bring back lost industrial jobs. The Telegraph's Rosa Prince, a former Daily Mirror journalist, seems to read too much into this by saying Cameron was breaking diplomatic convention and overtly backing McCain for president. 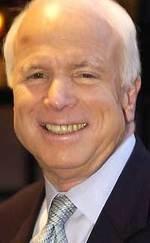 "Quiet ripples of excitement among young turks at Conservative Central Office, as the Vietnam veteran John McCain edges into pole position to become the Republican Party's presidential candidate. Junior aides have been informed that it is "taken as a given" that some of their number will be heading across the Atlantic should the Arizona senator get his name on November's ballot for the White House. Those selected will be able to cut their teeth in an election environment. The jostling for plane seats has started. McCain and the Tories already enjoy a cosy relationship. The American visited Westminster in 2005 as a guest of Michael Gove, now shadow Schools Secretary, and spoke at the Tory conference in Bournemouth the following year, at the invitation of the shadow Chancellor, George Osborne." Also worth noting is that whilst McCain spoke in glowing terms about Cameron in January 2006, by March 2007 he was saying that he felt decieved by Cameron about his stance on Iraq, after Cameron opposed more US troops in Iraq. Our poll of thousands of Conservative Party members last June put McCain at a very distant second to Giuliani. We'll repeat the poll soon so it'll be interesting to see if they have switched places since then. This relationship has fallen into disrepair in recent years. Tony Blair became the special friend of America. He understood that the world changed on 9/11, and the White House didn't just get close to Blair during his premiership but also chose to cold shoulder the conservative opposition at the same time. The previous Conservative leader, Michael Howard, was told that he wouldn't be welcome at the White House. Karl Rove took exception to the ways in which Howard's Tories were making the Iraq war difficult for Tony Blair. Today's Telegraph reports a growing distance between George W Bush and Gordon Brown. Relations won't have been helped by yesterday's highly politicised draw-down of troops. At the heart of the cooler relationship is a belief in Washington that British troops - soon to exit - have underperformed in Basra. Confirming speculation that appeared here a few weeks ago, the Telegraph's Toby Harnden reports that the President and Prime Minister have only spoken twice since their Camp David summit in July. Is this an opportunity for Britain's Conservatives to get closer to the White House? It's an opportunity they are unlikely to take. Shadow cabinet minister Owen Paterson MP was in Washington recently for high-level meetings but John Bolton, attending this year's Tory Conference was only granted fringe status. David Cameron was unwilling to give the former American Ambassador to the UN a platform slot. The Conservative leader wishes to portray a more moderate face to the electorate and that explained Mayor Bloomberg's keynote speech to the Conference's opening day (see picture and report). My guess is that the Conservative leadership is content to pursue closer links with Bloomberg and Schwarzenegger but not with the Bush administration. Many American politicians are also suspicious of David Cameron. Rudy Giuliani declined to have his photo taken when he recently met David Cameron in London. The closeness of Team Brown to Democrat politicians was confirmed again last week when it became very evident that much of Gordon Brown's speech to the Labour Conference was inspired by Bob Shrum, long-time consultant to Al Gore, John Kerry and other opponents of the Republican Party. PS Apologies for the shortage of posts over the last week. I've been at the Conservative Party's Annual Conference - read some of my reports here. Normal service should be resumed from now on. Simon Burns, Conservative MP for Chelmsford, says that Clinton is a "new Tory" and Conservatives should feel able to support her in the interests of the special relationship. The importance of the Special Relationship with America has always rightly been the cornerstone of British foreign policy – with the short exception of the Heath premiership - which explains why Tony Blair found it so easy in January 2001 to move so swiftly from supporting Bill Clinton to being such best friends with the most rightwing Republican president since Herbert Hoover. This fact presents a serious challenge to too many Conservatives in Britain, who ostrich-like, are not prepared to confront. The problem is their inexplicable attachment to a party that has produced the viciousness of Tom Delay, the hypocrisy of Mark Foley and David Vitter and the economic policies of George W Bush which have turned the budget surplus of Bill Clinton into a massive deficit due to tax cuts for the rich and greatly increased public spending. To add insult to injury, they find the nauseating mantra of the neo-cons attractive. On the 20th January 2009 this will all change because due to the ineptitude of George W Bush in both his management of the American economy and the war in Iraq, the smart money is on a Democrat entering the White House. Barring an implosion of massive proportions that Democrat will be Senator Hillary Rodham Clinton of New York. The Telegraph's US Editor, Toby Harnden, reports today (Update: And now on his blog) that George Osborne didn't meet George W Bush despite briefings that he would. Obsorne's office has confirmed to BritainAndAmerica that there wasn't a private meeting, but also that they hadn't claimed that there would be. I'm told they plan to have one in the near future. George and Laura Bush did personally invite him to the White House event however, and he met with Administration officials such as Glenn Hubbard. The details are important in assessing the willingness of both parties to rebuild relations, relations which Osborne has said are important, but it is a shame that the details of the laudable malaria initiatives have been smothered by this. Just a couple of weeks ago Gordon Brown and George W Bush held their first meeting. A less substantial but still significant meeting will happen today when George Osborne, Britain's Shadow Chancellor, meets the President at a White House event on malaria. They are expected to hold short, private talks soon afterwards. The Bush administration is particularly proud of its $1.2bn five-year malaria initiative for Africa's hardest-hit nations. George Osborne has also taken a personal interest in the issue. Today he has appointed Professor Jeffrey Sachs as "a personal adviser on tackling the global scourge of malaria". There are a number of reasons why relations have deteriorated since Iain Duncan Smith's leadership of the Conservative Party. British Tories have not enjoyed watching the closeness of the Bush-Blair relationship and the ways in which the White House snubbed Michael Howard after his criticisms of the Iraq war. David Cameron, never an enthusiast for the Iraq war, was at Michael Howard's right hand when Karl Rove froze relations with the Tories and the Tories have felt little electoral incentive to repair relations with an administration that is both very unpopular in the UK and will have expired by the time David Cameron can have a realistic expectation of becoming Prime Minister. On the Republican side there is disappointment at the ways in which the Tories have appeared to play politics on Iraq. Great offence was taken at David Cameron's decision to use the fifth anniversary of 9/11 to rebalance the Tory-GOP and UK-US relationship. More deeply there is a sense in the Republican party that 'a Europeanisation of the Conservative Party' is underway with the Tories becoming more European in their policies on terror, Israel, the level of taxation and climate change. What is not true is that there is a permanent anti-Americanism within the Conservative Party. Although there are some isolationist and Powellite Tories who will never value close relations with the United States most Tories have a deep respect for America. David Davis, Iain Duncan Smith, Liam Fox, Michael Gove, William Hague and George Osborne are key figures in this respect. David Cameron has also been proud that he brought John McCain to last year's Party Conference (although there has been a falling out since) and that California's Arnold Schwarzenegger will be addressing this year's Blackpool gathering (another Osborne coup). It is notable, however, that both McCain and Schwarzenegger are climate change campaigners. Team Cameron want a relationship with the Republican Party but they want it to be more on their terms. Good relations with the Republican field for 2008 are more important than the current White House. What Sam Coates and I found in Washington, however, was a strong willingness within Republican circles to stop picking at old wounds and move to build better relations in future. There was an acceptance that although the Conservative Party was no longer the party of Margaret Thatcher the Labour party would soon cease to be the party of Tony Blair. Labour without Blair will be less friendly to the long-term interests of the United States than a Conservative Party with Davis, Hague and Osborne in its upper ranks.